72 year-old man with progressive dysphagia (difficulty swallowing) to solids, who was found to have this firm, midesophageal mass causing high-grade obstruction of the esophageal lumen. 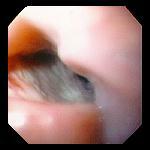 Much of the remaining lumen consisted of the groove in the tumor caused by the longitudinal ulcer. 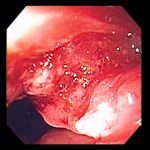 70 year-old man with esophageal obstruction caused by this tumor with a deep, wide ulceration. 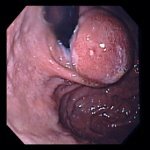 Partially obstructing proximal esophageal mass in a 77 year-old man with dysphagia and weight loss. Recurrent submucosal squamous cell carcinoma in the gastric cardia of a 62 year-old man who had been treated for squamous cell carcinoma of the midesophagus 12 months earlier with chemotherapy and radiation therapy .